It feels like it's been a while since it was book day on the blog, but these are always some of my favorite posts to write. 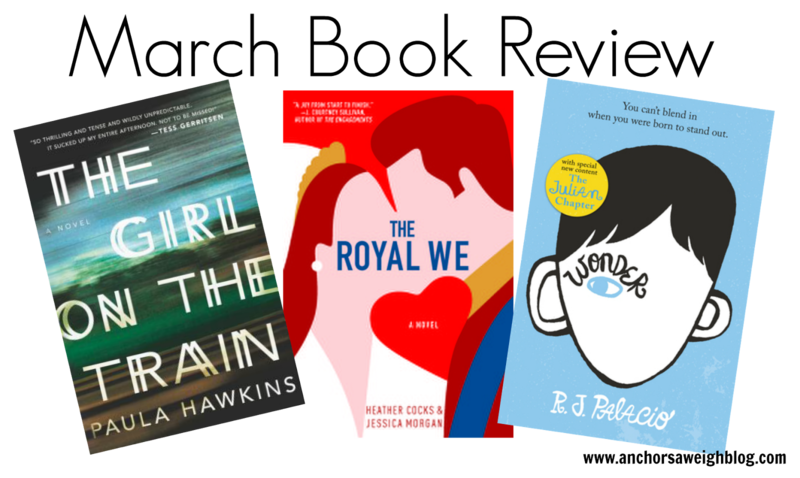 I love talking books with people (my high school self is calling my current self a nerd right now), and I love suggestions on what to read next! This book came highly recommended from just about everyone. 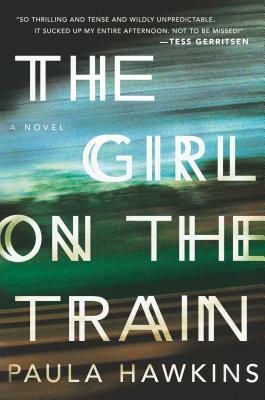 I feel like it took me a while to get into, and I expected with a thriller like this one to be sucked in from the beginning. Once I was into it, I enjoyed it. I couldn't put it down at the end, but I did struggle to pick it up during the first half. The storyline also made me sad, which I think was the intent. The main character is an alcoholic, and while the author did a good job conveying such raw and real emotions, it was definitely depressing. I would love to hear your thoughts on this one! This one also came highly recommended by the rest of the world. It was definitely enjoyable and a really fun story. It is told from Bex's perspective, your normal, every day American girl who falls in love with a prince. 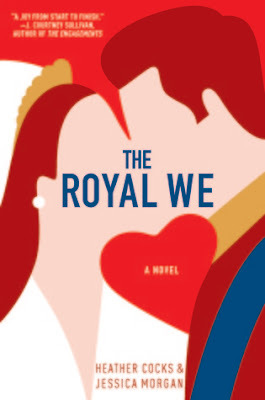 It felt like a real glimpse into how Kate must have felt falling in love with William and all the hooplah that came with it. Great story, but man it felt like it went on forever! That was really my only complaint. Other than that, it was a sweet read and a fun story. I could write a whole post on just how much I loved this book, and it still wouldn't do it justice. Yall, it was easily one of the best books I have ever read! 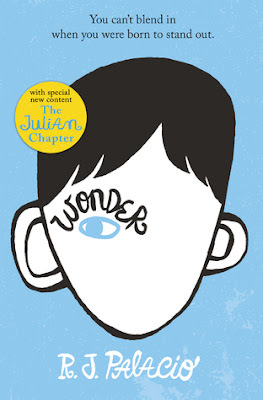 It's about a fifth grade boy named Auggie who is severely deformed in the face, but all of his mental capacities are in tact. Different chapters are told from different points of view, so you get to hear about his life from Auggie himself, his sister, and a few of the kids who befriend him. The thing I loved so much is that, through his story and encounters, you realize he is a normal kid just like everyone else. If this had been a movie, I don't think it would have been nearly as powerful. They give you a few ideas of what his face looks like but really let your imagination create whatever picture it wants. Since you aren't staring at an image of his deformed face, you end up focusing on his character and the feelings he expresses. Yall, it was powerful. I think every kid should read this and every adult should too. I cannot recommend it enough. If you know me personally, you know I love the great state of Texas something fierce. It's where I grew up, it's where my family lives, and it will always be home. 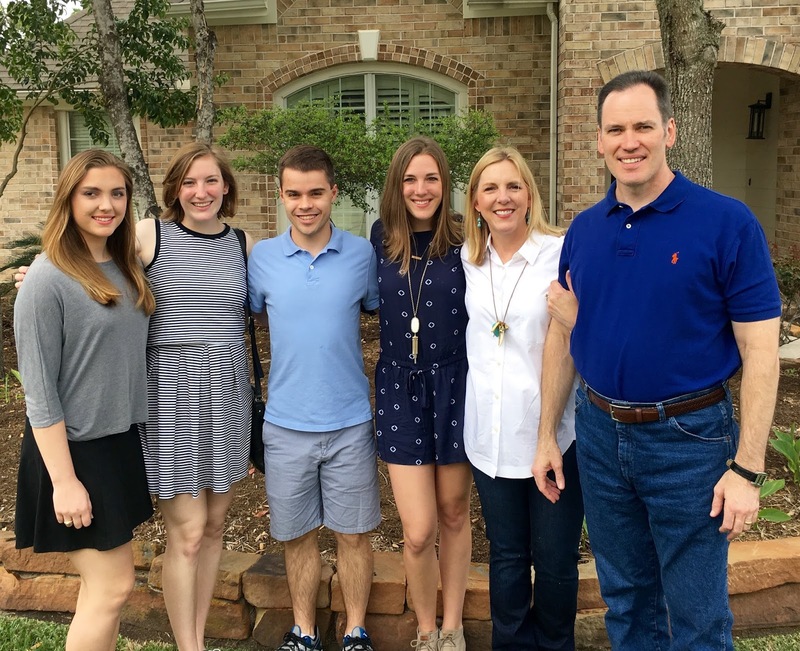 I flew back last weekend to spend Easter with the family while Parker was away for the weekend. It's never fun being without your buddy on holidays, but it was wonderful to get to spend Easter weekend with my family in my favorite state! We did the usual- Easter church service and eating all. the. food. I'm not sure how many deviled eggs I had, but I'm not mad about it. Honestly, it was just a good weekend of family togetherness. I always like to recap these moments because they are oh so fleeting. Here are a few snapshots of our weekend celebrating the risen King! My parents' church always adds services around the holidays, so we switched things up and went to Easter service on Saturday night. Here is a shot of everyone before church! We were missing Parker, my twin sister (Danielle), and her husband Logan (who was snapping the picture). My littlest sister, little sister, and her boyfriend are on the left, and my parents are on the right. Danielle is a nurse and unfortunately had to work this weekend, but she showed up after church so I could hug that growing belly! To say I am excited to be an aunt is an understatement. I am so in love with this little babe! I got to meet her at the hospital Sunday morning for an ultrasound to see the little wiggle worm in action. Happy aunt! I don't get to see my two little sisters (Natalie and Faith) as often as I want, so it is always a treat when we are home at the same time. It was also my dad's birthday this weekend, so all his girls were home to celebrate! 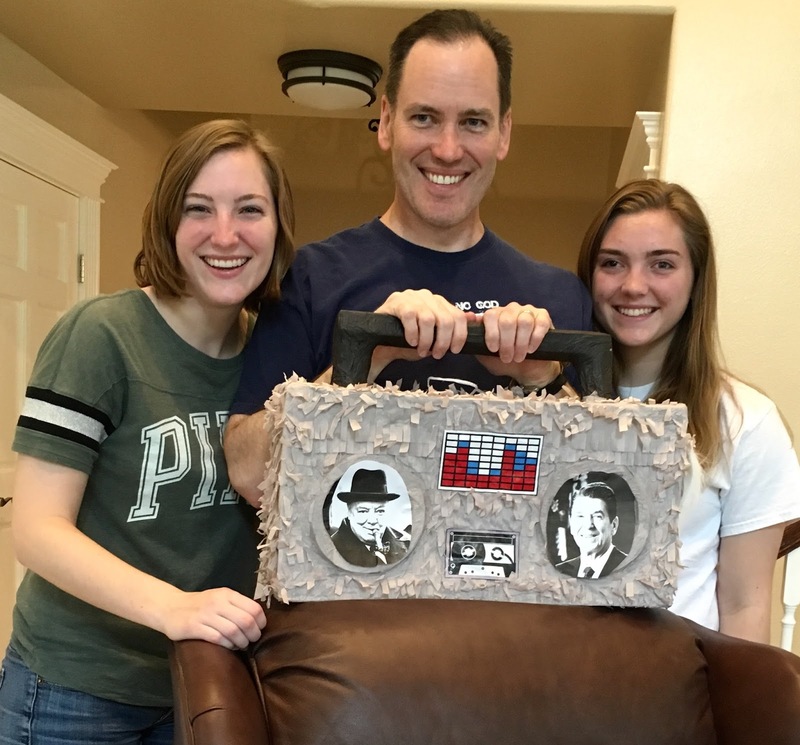 Natalie and Faith's gift for my dad was so out there and hilarious- a boombox pinata (he loves the 80s) with pictures of Winston Churchill (he loves that guy) and filled with margarita mix and patron (the man loves his margs). Who thinks of this stuff, right?! Jenny was staying with a friend over the weekend, so I got to love on my favorite Texas pups! 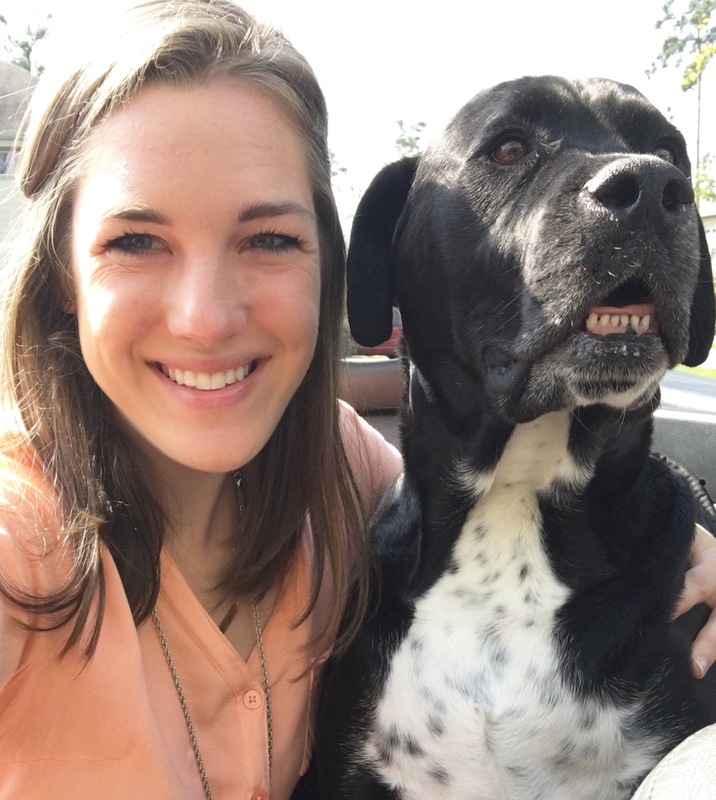 I rode in the back of my brother-in-law's convertible with my fur nephew Sully a couple of times over the weekend. 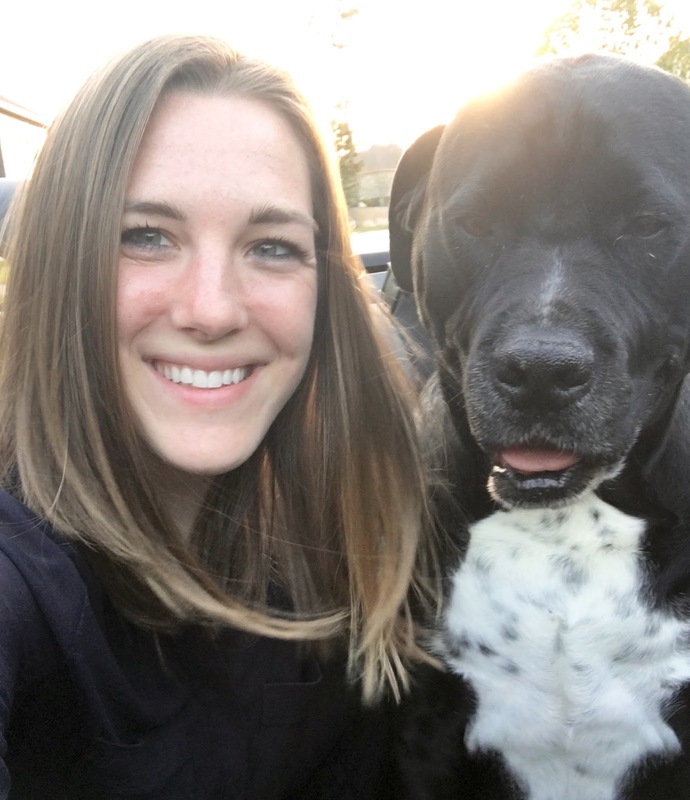 We love dogs around here! So that was it! It was a wonderful weekend spent with people I love. Had Parker and Jenny been there, it would have been just about perfect. Easter 2016 is in the books! 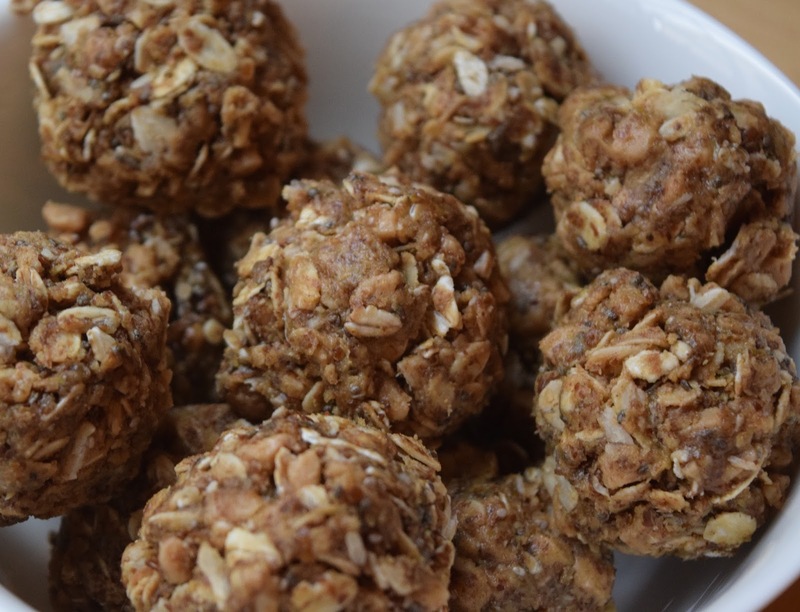 Several months ago, I shared my favorite recipe for No Bake Energy Bites. I have probably made these energy bites 15 times with no sign of stopping soon. We love them around here! They are the perfect snack that will simultaneously satisfy any sweet craving and fill you up. There are so many great nutrients in these little bites, and since they are so dense, it's hard to eat more than 2 at a time. For an over snacker like me, that is a win! I decided that I could probably swap out different ingredients to create new variations of my favorite midday snack. After rummaging through the pantry and finding toffee pieces, I knew I had to try it. I am so glad I did! I loved them and just have to share. 1. Mix all ingredients together in a bowl using a spoon. 2. Place mixture in the refrigerator for 30 minutes. 3. 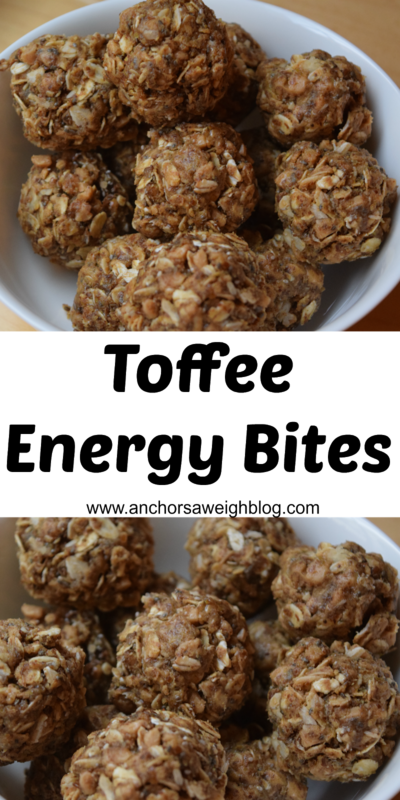 Remove from refrigerator and shape into 1 inch balls. Hello hello! I am happy to be back from my little blogging hiatus, rejuvenated and ready to get back into the swing of things! 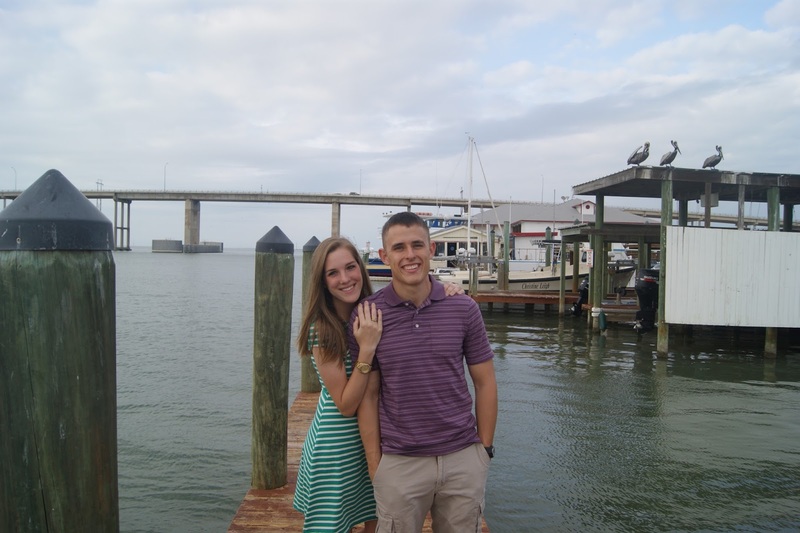 Parker and I came up with the idea for a "military spouses" blog series a couple of months ago. 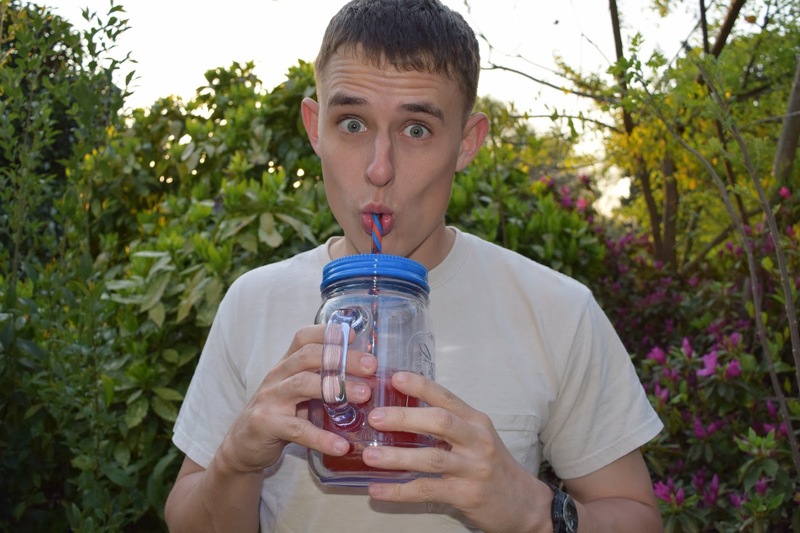 I am by no means an expert on the military lifestyle (is anyone ever? ), but I have learned a thing or two over the last five years. I've been brainstorming for this series and talking through topics with Parker, and I am so excited to finally get started! 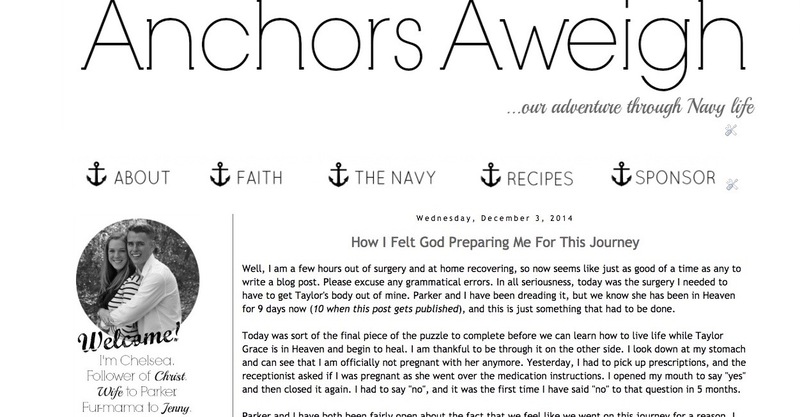 Aside from messages from people inspired by our journey with Taylor Grace, my very favorite emails to get are from fellow military spouses who happened upon this little blog. I love connecting with others walking this same path and answering the questions I can. I remember having so many questions with no one to really turn to, and it can be a very lost feeling. 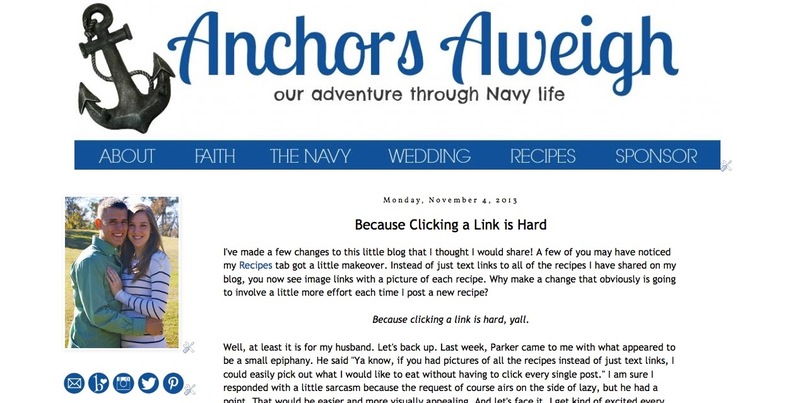 My goal with this series is for it to be a resource for other military wives. 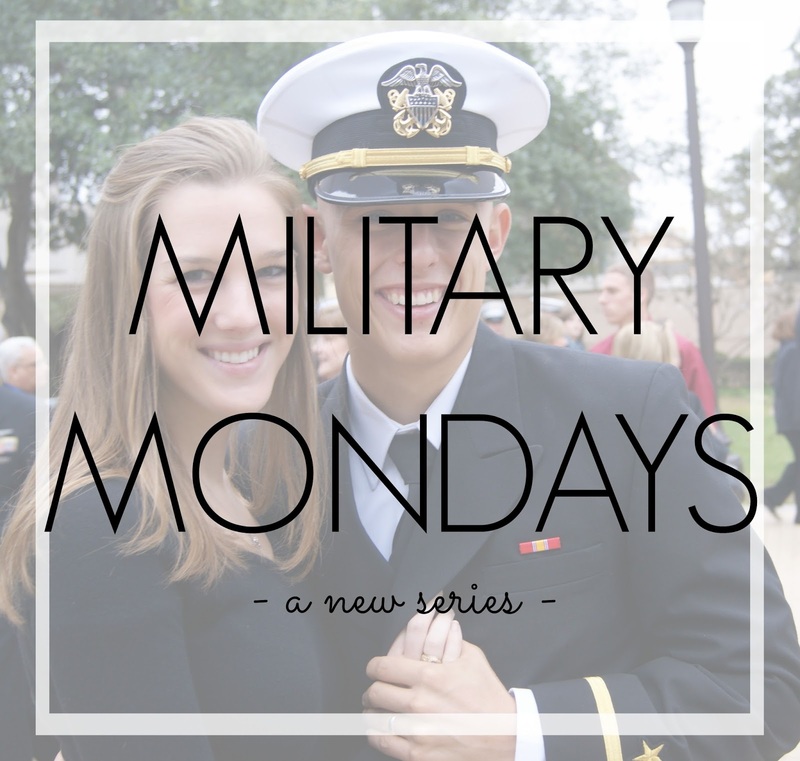 For the foreseeable future, I'll dedicate Monday to something military related. 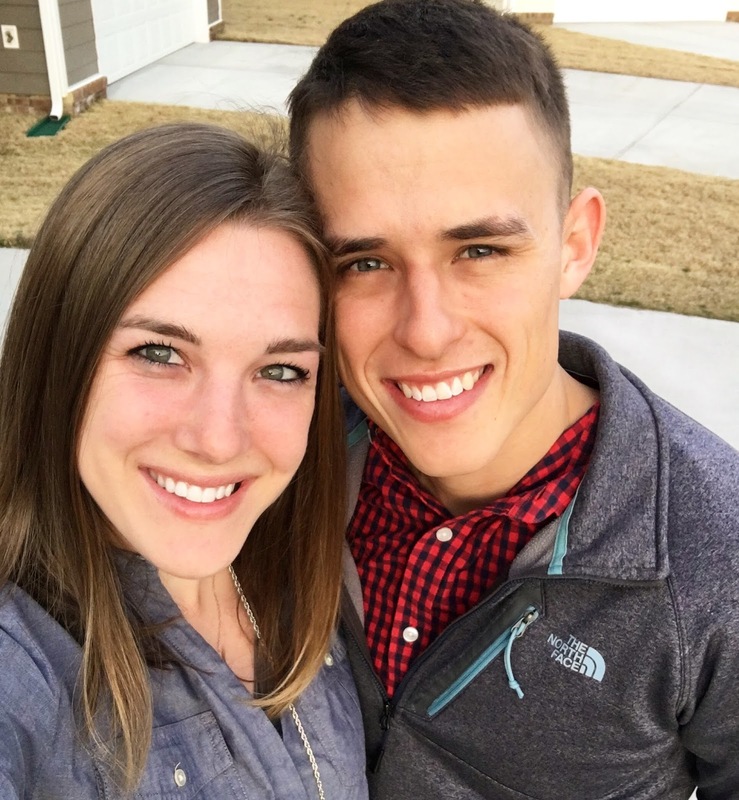 We will cover everything from Tricare to ranks to spouse groups, and I'm looking forward to learning more in the process of writing these. 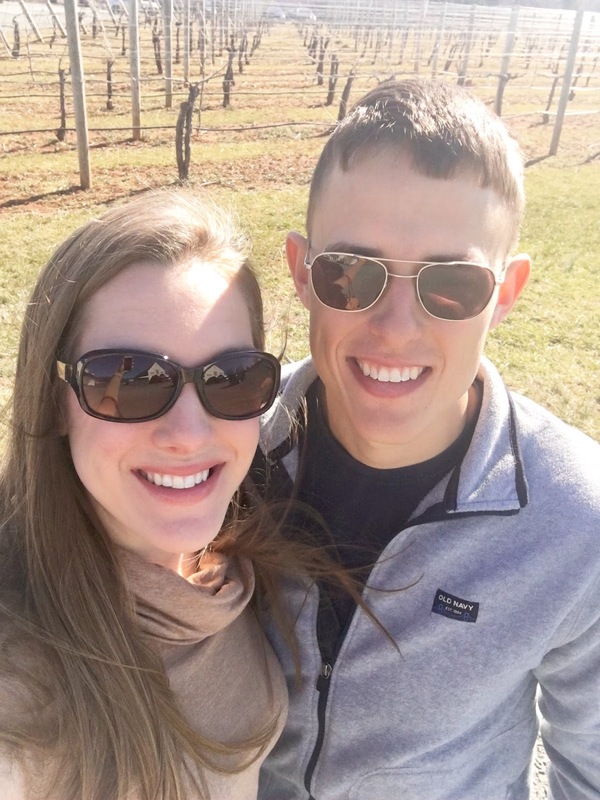 Military spouses: If there are any topics you would like to see discussed, please let me know in the comments! One of my March goals was to take a week off from blogging. I want to recharge my batteries and do a little planning for this little space of the interwebs. A break every now and then is good for the soul, and this week seems like just as good a time as any! We will be back next week with our regularly scheduled programming! Have a great week- I'll miss you all! I have been bursting at the seams and am so excited to finally get to spill the beans... Parker and I are going to have a little niece or nephew this fall! My twin sister is about 15 weeks pregnant with the perfect baby that we cannot wait to spoil the crap out of. 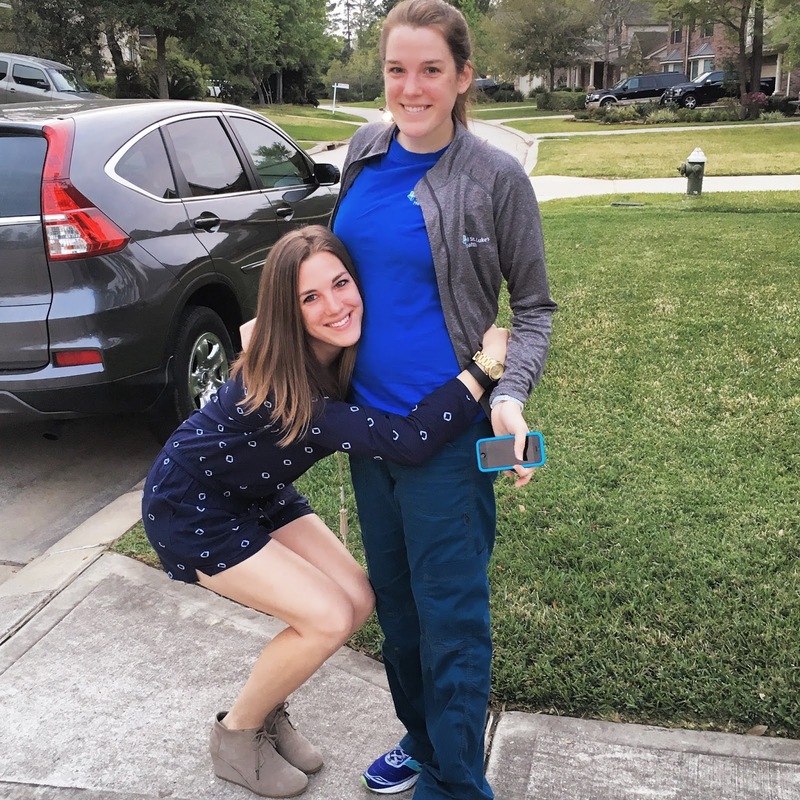 When I flew home to Texas for my birthday, Danielle (twin sister) told me she would pick me up from the airport. 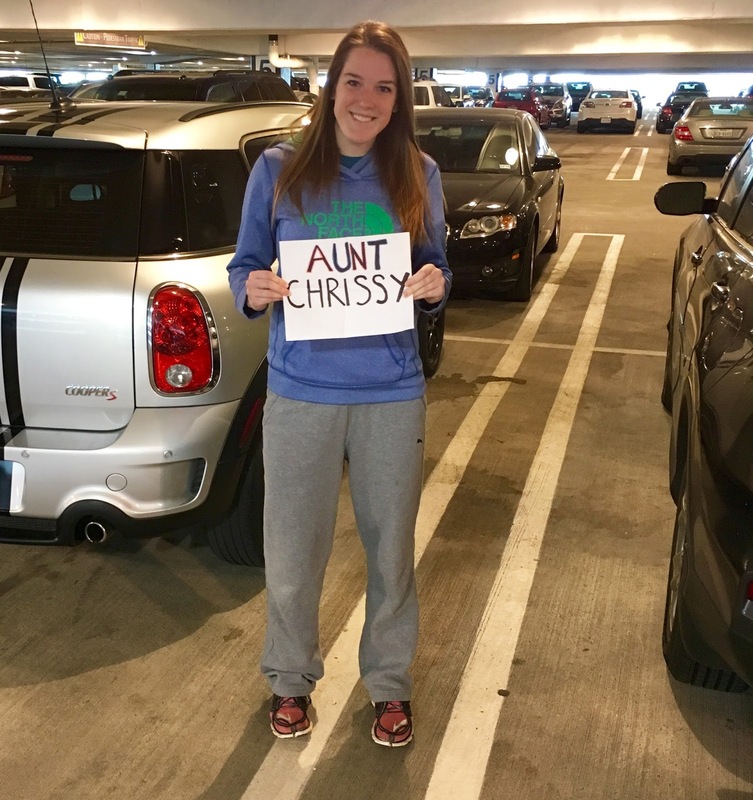 When I arrived, she made up an excuse of why she had to park the car and met me inside the baggage claim area. I didn't understand why she couldn't just wait in the car line but chalked it up to her inexperience with airports and didn't think anything of it. 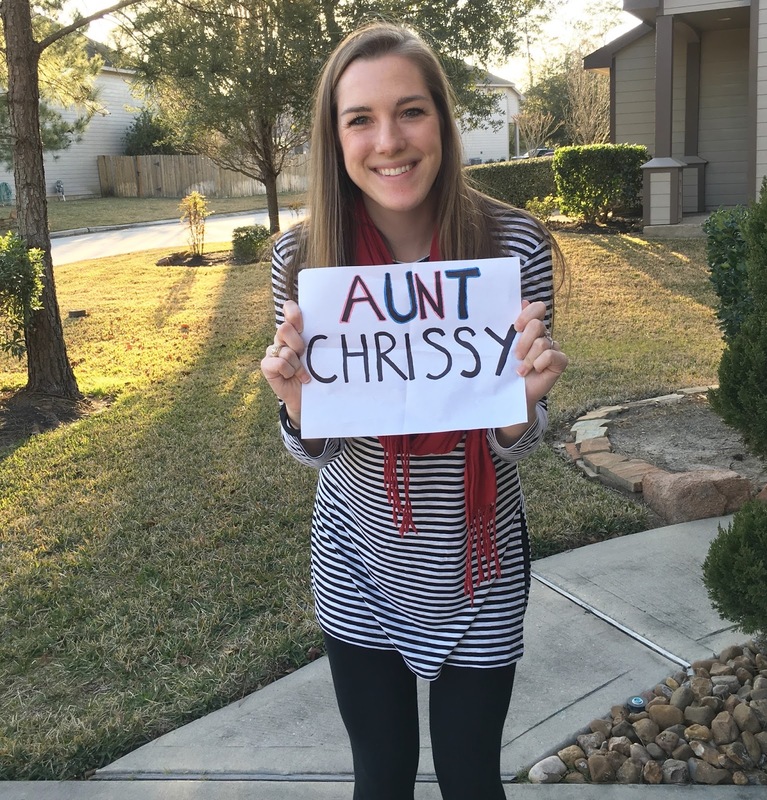 When I saw her coming down the escalator, she held a sign that read "Aunt Chrissy". I'll be honest- I totally didn't get it at first. I think I said something like "aww, thanks", to which she followed "you don't get it, do you?". I think I gasped so loud the entire airport heard me! Tears were flowing and I just couldn't believe it! There is something so special about your twin sister being pregnant. I can't even describe the joy I feel for her. It's funny, because I'm usually pretty good about the whole "missing everything due to the military" thing. I understand and accept that we just won't get to be with our families for every little thing that comes up, but knowing I am going to have a niece or nephew 1400 miles away is a tough pill to swallow. I loved growing up with my aunt, uncle, and cousins at arms length and want that for this baby, but we will savor the time we do get. My sisters and parents all live close by, so this baby will still have so much family around to love on him/her. How cute is their Disney-themed reveal? 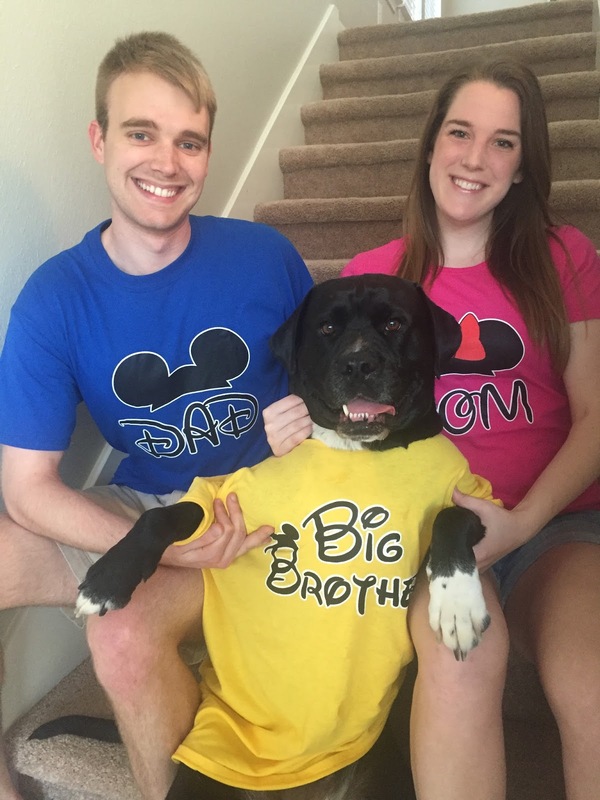 Sully the pup is very excited to be a big brother! I usually compile pictures from my phone or these "Life Lately" updates, but today I thought it would be fun to grab them from my Instagram feed. There are a few hundred less photos of my dog on there, but otherwise, Instagram is how I document what our little clan has been up to. Exercise gives you endorphins. Endorphins make you happy. Happy people just don't shoot their husbands! Everyone name that wonderful movie. Seriously though, this guy is the best work-out buddy. I am not one of those people that loves working out. I love the feeling I get after I've worked out, but I complain six ways to Sunday before and during. Working out together makes it so much more bearable. 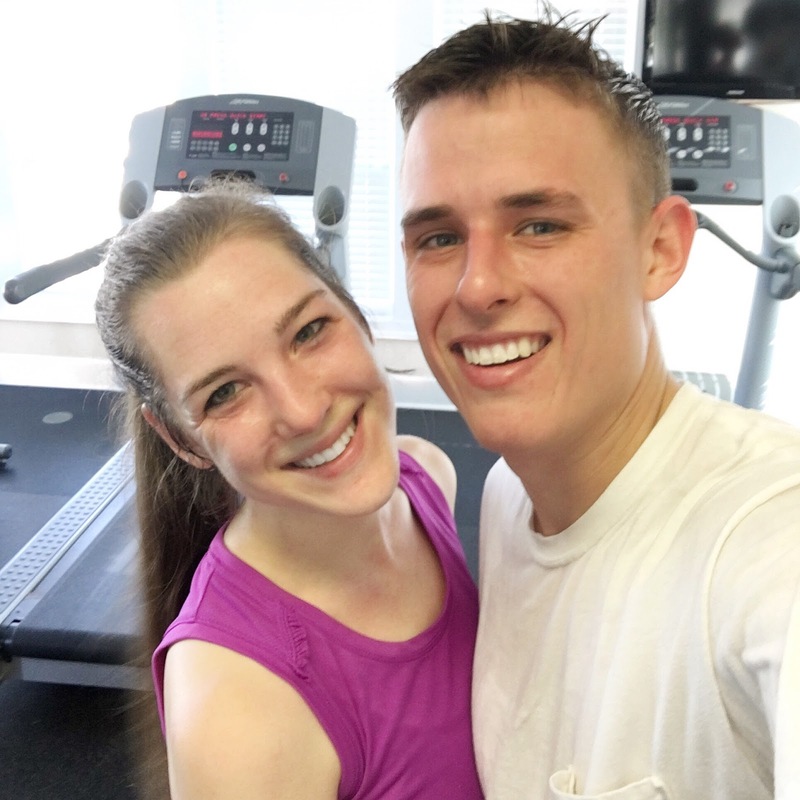 The couple that sweats together stays together. That's a saying, right? 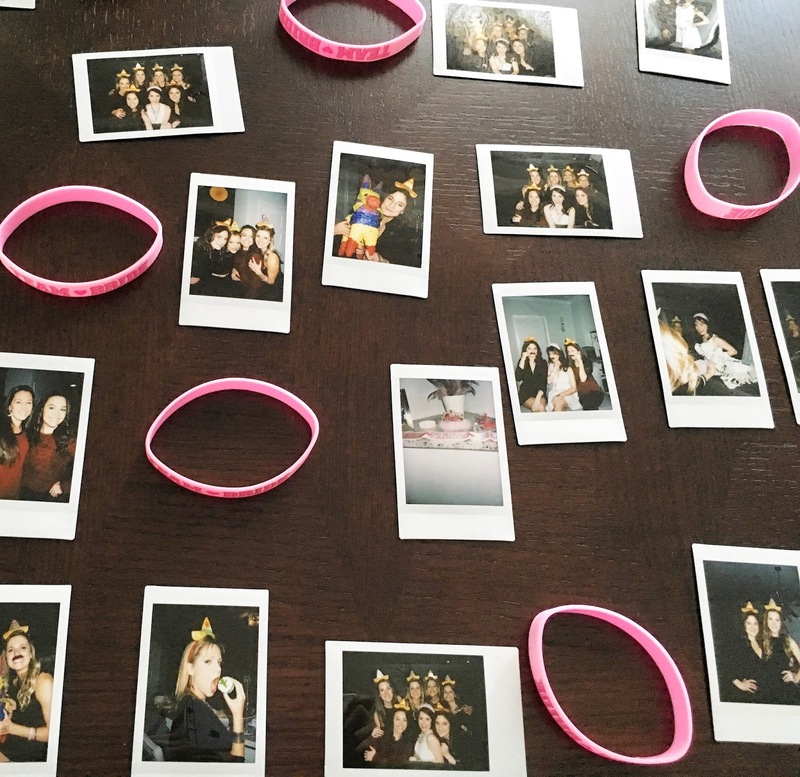 I recently blogged about attending a bachelorette party in your late 20s, a far cry from attending a bachelorette party at age 22. I snapped this picture of our polaroid collection. I know we live in the age of smart phones, but there is something really fun about taking polaroids and waving them around like it's 1999. I have a weekly Bible Study I go to with some of the sweetest girls around, and it's one of my favorite parts of the week. We love Jen Wilkin studies and are on our second one (currently Judges). 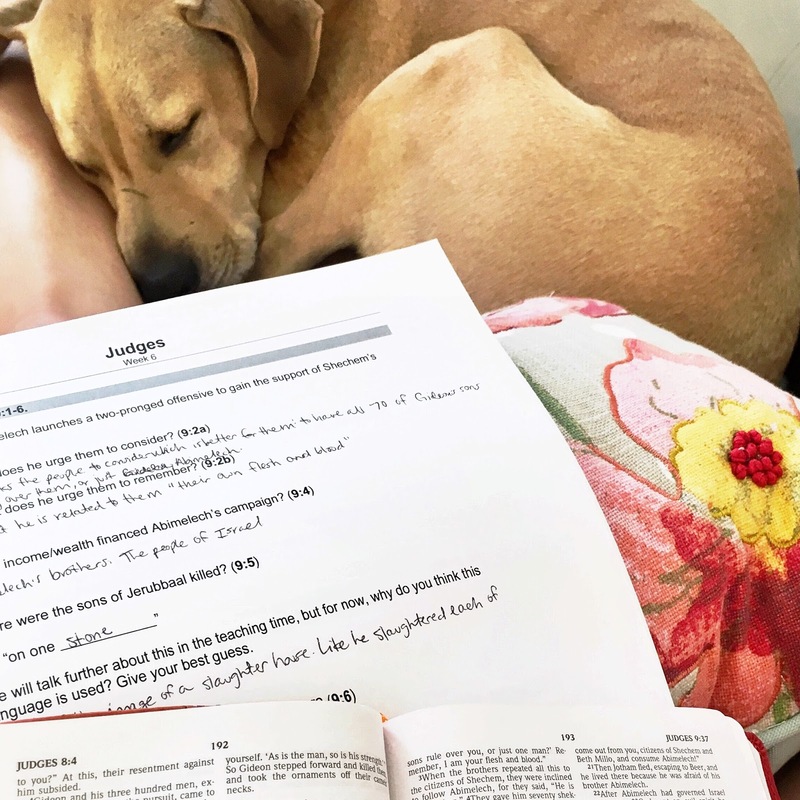 Jenny makes a great Bible Study buddy! I am so thankful my husband puts up with my incessant picture-taking. I snap a picture before most date nights, and this past Saturday was no exception. We did the typical dinner-and-a-movie night and just had the best time. This last one was taken by my friend Kourtney over at The Martines and the Marines, who I finally got to meet in real life last Friday! 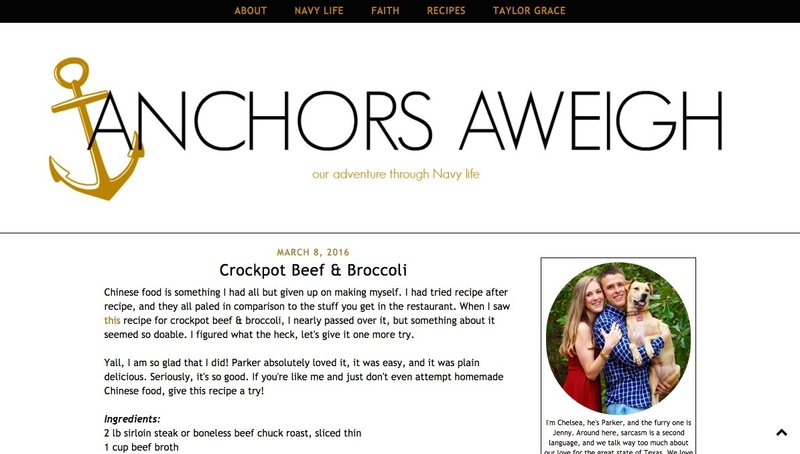 You may remember her from this post she wrote on my blog back in December. She's been one of my favorite bloggers to follow, and she is just as sweet and wonderful in person! Her kiddos are like little pieces of Heaven. 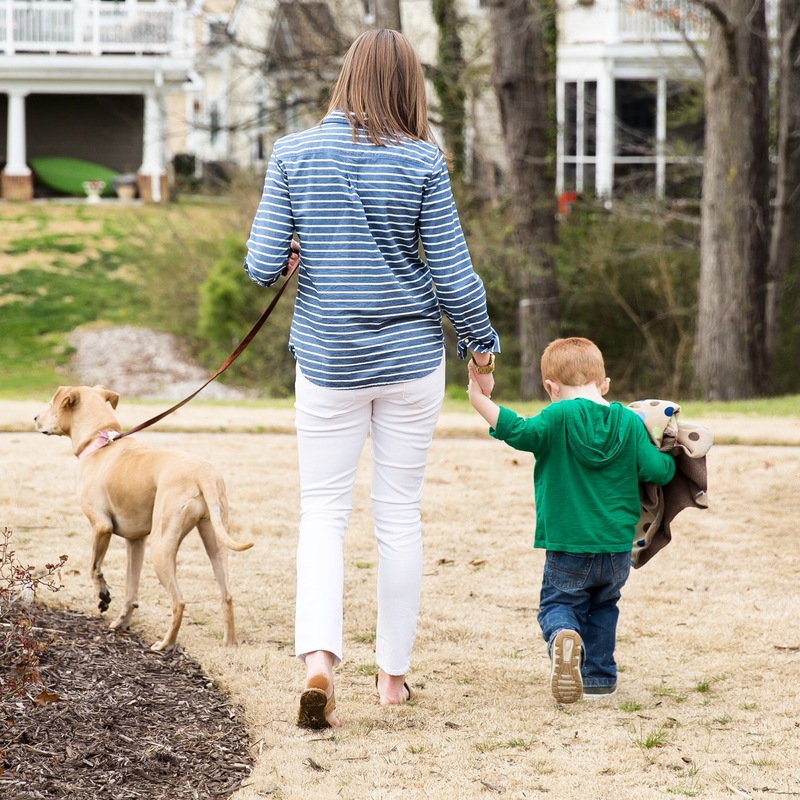 When Mitchell grabbed my hand on our walk back from the park, I was ready to scoop him up and keep him forever! That's life lately, according to Instagram! It's been a while since we did a Q&A, and since there are some new faces around these parts, now seems like a great time to play 20 questions! 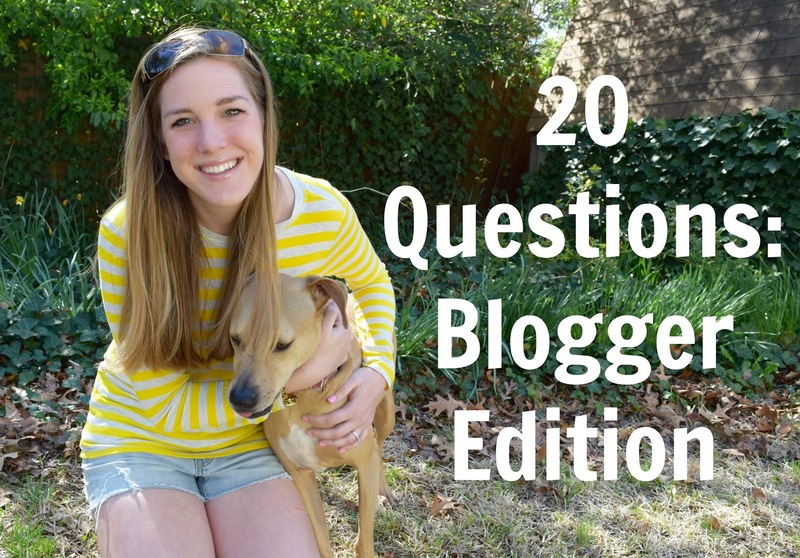 I'm going to answer 20 questions (thanks Samantha for the questions! ), and later this month, Parker will play along and answer the same 20 questions. Let's get to it! 1. Are you named after anyone? No. My parents wanted to give me and my sisters our own unique names, so they didn't use any family names. 2. When was the last time you cried? Hmm, I tear up a lot, but I can't remember the last time I cried actual tears. 3. Do you have kids? One, but she's in Heaven. A daughter named Taylor Grace. 4. If you were another person, would you be a friend to yourself? I think so, but we all tend to see the best in ourselves now don't we? 5. Do you use sarcasm a lot? To a fault. My close friends are pretty good at knowing when I am being serious, but there are still times where I have to make it clear that I was being sarcastic. I blame Chandler Bing. 6. Will you ever bungee jump? Not if I can help it! I am not a thrill seeker. 7. What's your favorite cereal? Cinnamon Life. I eat it every day! 8. What's the first thing you notice about people? This sounds strange, but the first thing I notice about someone is their left hand. I always look to see if they are wearing a wedding ring. 10. Scary movie or happy endings? Happy endings, of course! 11. Favorite smells? Hmm, the beach, fresh flowers, Jenny, Parker. 12. Summer or winter? Summer. I don't do cold well! 13. What's the furthest you've been from home? I went to Greece in college- it was an amazing trip! 14. If you had to shop exclusively at one store, where would it be? I am a big Old Navy fan! 15. Where were you born? The great state of Texas. 16. What are your hobbies? 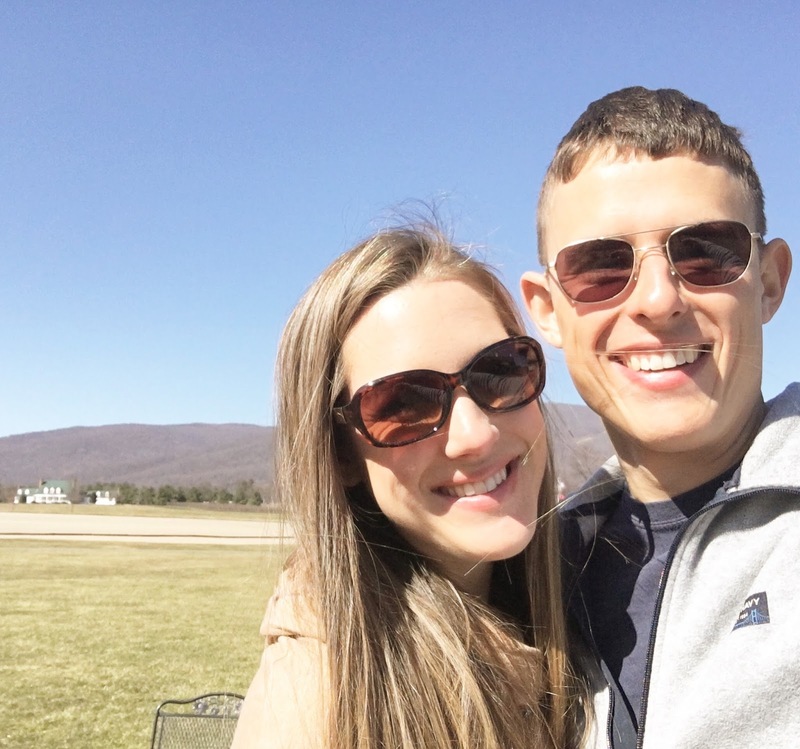 Running, blogging, reading, walking my dog, and hanging out with the hubs. 17. Do you have any pets? A brown dog named Jenny! 18. What's your favorite movie? The Sound of Music... such a classic! 19. Do you have any siblings? Yes! A twin sister and two younger sisters. 20. What do you want to be when you grow up? Since I am 27, married, and working, I sort of think I am already grown up. I always wanted to be a wife and mom and still see those two roles as the ultimate dream! Sometimes, you just need a quick dessert you can whip up on the fly. 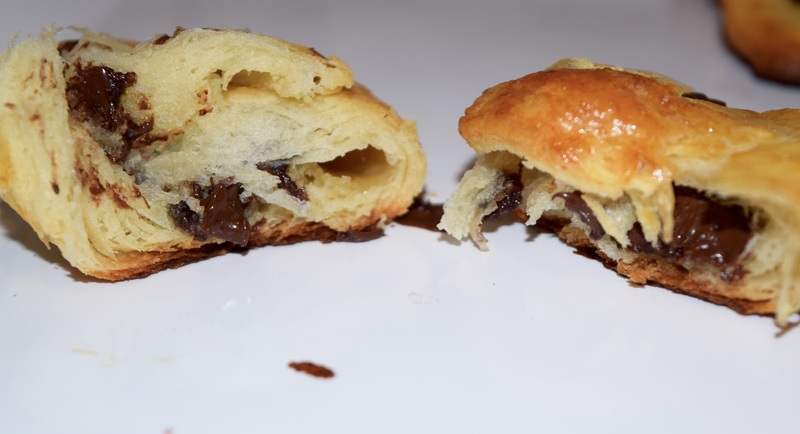 I had a bag of chocolate chips, some marshmallows, and a can of crescent rolls, and this recipe was born. The only downside to these delicious Smores Crescent Rolls is that they are way too easy to consume all in one sitting. I had 3 and considered that to be exercising extreme self control. I'd hate to think how many I could chow down on if I wasn't trying to limit myself! This little treat took about 10 minutes from start to finish with very little clean-up at the end. Winning! If you need a quick weeknight treat to satisfy the sweet tooth, these Smores Crescent Rolls are for you. 1. Preheat oven to 350 degrees and line a baking sheet with foil for easy clean-up. Spray with cooking spray and set aside. 2. In a small bowl, whisk egg with a fork to make the egg wash and set aside. 3. Unwrap the crescent rolls. Place a few chocolate chips and 3-4 marshmallows at the top of each one, and roll to secure in place. 4. Brush egg wash on top of each roll. 5. Bake for 9-11 minutes or until golden brown. Those were the words my hairdresser spoke to me as she cut off nine inches of my hair. Comforting, don't you think? I've always loved the idea of donating my hair, but it never was long enough to take the plunge. I went in for my routine haircut (and by routine, I mean every 7-8 months) for a good 3-4 inch trim. By my estimation, donating it was out of the question unless I wanted a short bob. I never was very good with a ruler. 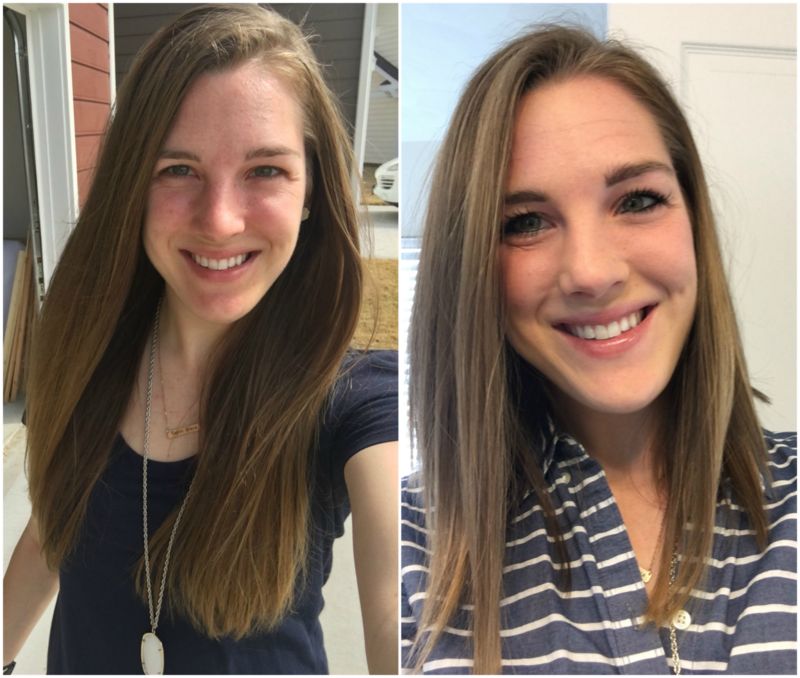 Before my hairdresser started cutting, I asked her (hypothetically, of course) if my ends were healthy enough to donate and what it would look like to cut 8 inches off. By my research, the least I could donate was 8 inches. She said my ends were healthy and that she could take off 9 just to be safe, still giving me hair just below my shoulders. Hairdresser: Wait, you didn't just go through a breakup, did you?! Me: No no, I'm happily married. This isn't a Britney Spears circa 2007 crisis. In all seriousness, I really love the change! Typically girls wait until their husbands deploy to chop off all of their hair so that if the husband hates it, you have a good 6-9 months to grow it back out. I jumped the gun, but thankfully Parker really likes it! He said it reminds him of "college Chelsea". Fun fact: Of the 9 years we have known each other, I have had short hair exactly 1 of them. I had short hair when we met Freshmen year of college and am honestly surprised he remembers that. I barely remember that! Any ladies out there who have donated hair before? I'll do a post on my experience donating with my charity of choice once I complete the process! Parker and I are the first to admit that we have a very light-hearted marriage. Sarcasm runs rampant in our house and we don't take life too seriously. One of my favorite parts of marriage is getting to see things from a different point of view. If Parker has taught me one thing, it's that men and women really are different. Sometimes he says something, and I just stare and try to process the crazy that I just heard. And he does the same thing with me. Every now and then, I jot down my favorite Parker one-liners, and I thought it would be fun to share a few of them today (with his permission of course)! Parker: I don't want to tell you I'll do dishes ahead of time because then you won't clean as you go and there will be more for me to do. Parker: Playing games with you is a no-win situation. You talk crap when you win and pout when you lose. Chelsea: I actually can't be offended by this. Guilty as charged. Parker: You can't buy pants that are too big for you and say "oh I'm so skinny!". It's like cheating. Chelsea: (talking about cutting my hair) I'd like to give it some layers. Parker: Wait, does that mean dye? What does layers mean? Husbands really do say the dardnest things. They sure keep life interesting though! It occurred to me the other day that we have been on this Navy adventure for 5 years! 5 years and 2 months, but who's counting? 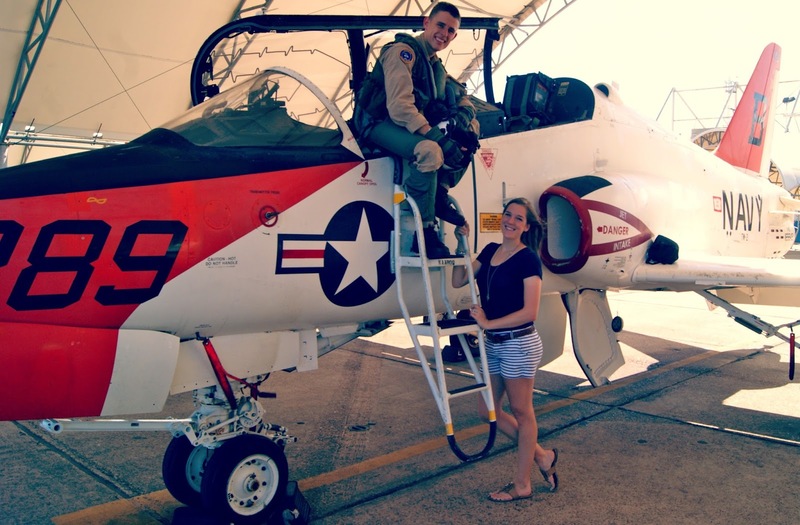 How we made it 5 years without a deployment can only be attributed to the many months Naval Aviators spend in training, but we aren't mad about it! We have lived in 4 different places and been a part of 5 different squadrons, each with their own set of highs and lows. I thought it would be fun to take a look at where we have been and what the first 5 years of Navy life looked like for us. Our first stop was... Pensacola, Florida! I've said it before and I'll say it again: the Navy really spoiled us with this one. Pensacola is beautiful! If you have to move away from your family and friends, you might as well go somewhere wonderful like Pensacola, Fl. 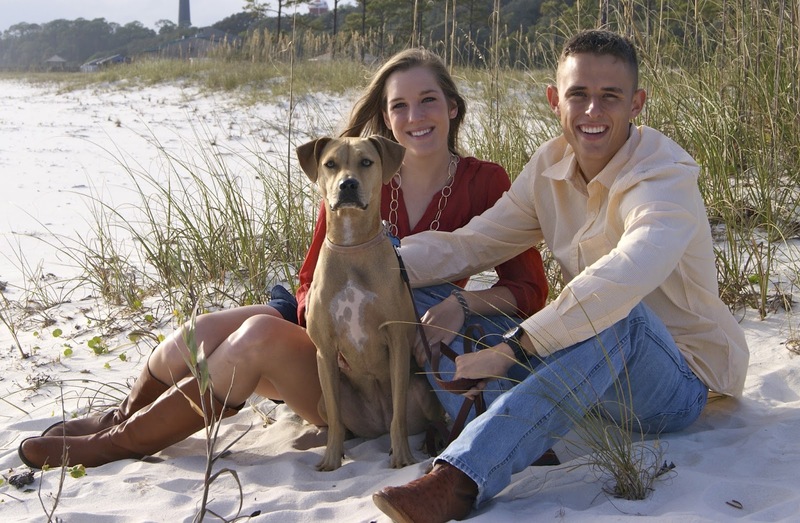 In my opinion, the emerald coast has the best beaches in the country, and we went almost every weekend in the summer. As beautiful as Pensacola was, our favorite part was the people. We met some of our best friends there and would go back in a heartbeat if it meant reuniting with those fine folks. Pensacola, you were good to us during our 16 month stay! Our next stop was... Kingsville, Texas! To say we were excited to go back to Texas is a gross understatement. We were over the moon to live in the motherland again! Kingsville was a small town in every sense but so charming. 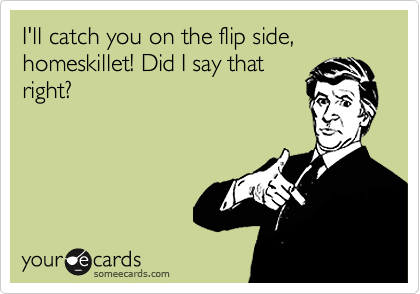 A lot of people hated Kingsville, but we'd (again) go back in a heartbeat. Our favorite thing about Kingsville was our neighbor across the street who became my best friend and like a second mom to me out there. We were in Kingsville for 9 months and hope to be stationed there again some day. Our next step was... Corpus Christi, Texas! Man oh man did we love living in Corpus Christi. It was only 45 minutes away from Kingsville, so it was a very short move. This was our first and only time living on base, which I highly recommend doing if you have the chance. You just can't beat the convenience and safety. Our house backed up to the ocean, and we loved taking Jenny on daily walks by the water. Our only complaint about Corpus Christi was that we weren't there long enough. We met amazing friends there, loved the city, and loved living on base. We were only there 4 months, but it was just the best time. Our next stop was... Norfolk, Virginia! This is the first move that I wasn't too excited about. Virginia was foreign territory, and Norfolk has a lot of areas you have to be careful in. We have met amazing friends here, and it's been neat to see an entirely different part of the country. Our first winter rocked our little worlds (hello, snowmageddon), but we survived. 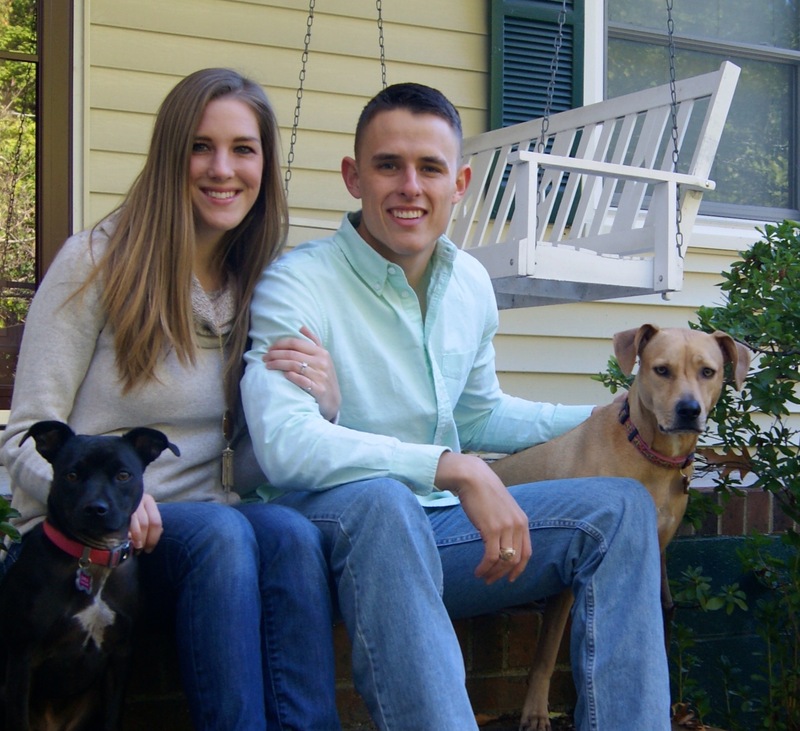 My favorite part of our year in Norfolk was that we had Darla, the pup we kept while her mom was away on deployment. We lived there right at 12 months. Our next stop was... Virginia Beach, Virginia! 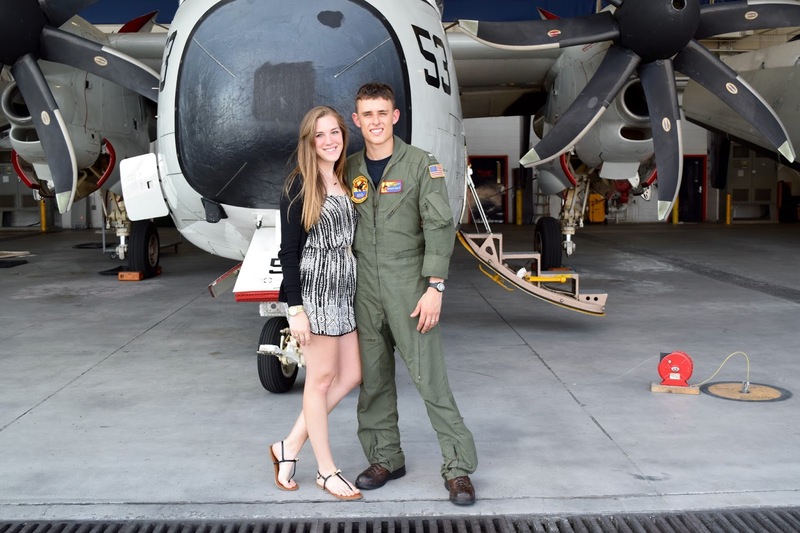 When we found out Parker would be joining the squadron in Norfolk for 3 years, we were so excited to buy a house. We chose Virginia Beach, right next to Norfolk, and absolutely love it. It's amazing what moving 15 minutes away has done for my outlook on this place. I went from really not caring for Virginia at all to wanting to stay in our current home forever. I love our neighborhood, I love Parker's squadron, and I couldn't ask for a better group of girlfriends to do life with here. We have been here 9 months with at least 2 more years to go, and it's nice to know there aren't any impending moves in our immediate future. It's been a fun first 5 years! Military life is wild and tough at times, but yall, it sure is fun. Chinese food is something I had all but given up on making myself. I had tried recipe after recipe, and they all paled in comparison to the stuff you get in the restaurant. 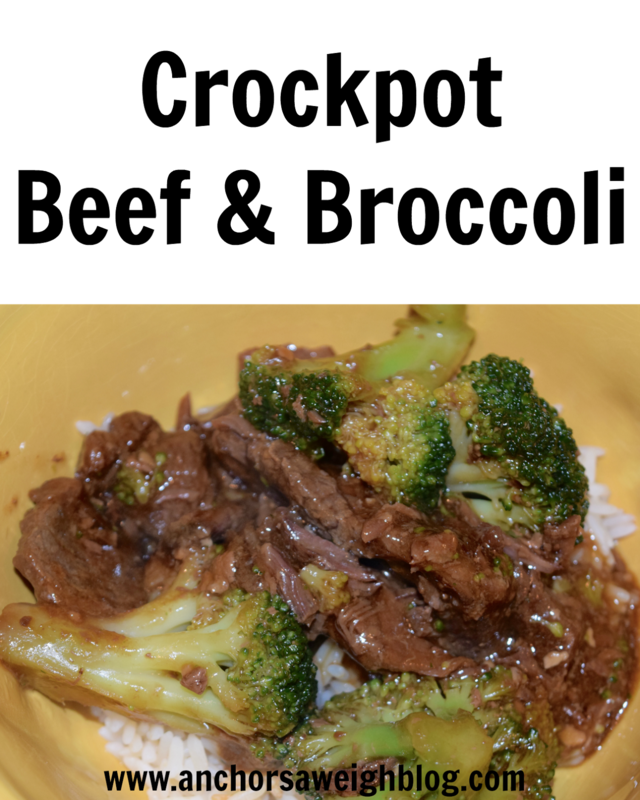 When I saw this recipe for crockpot beef & broccoli, I nearly passed over it, but something about it seemed so doable. I figured what the heck, let's give it one more try. Yall, I am so glad that I did! Parker absolutely loved it, it was easy, and it was plain delicious. Seriously, it's so good. If you're like me and just don't even attempt homemade Chinese food, give this recipe a try! 1. Line a crockpot with a crockpot liner for easy cleanup. 2. Pour beef broth, soy sauce, brown sugar, sesame oil, and minced garlic into the crockpot and whisk until combined. 3. Place slices of beef in the liquid mixture and stir to coat. 4. Cover and cook on low for 5 hours. 5. After 5 hours, whisk together corn starch and water. Pour into the crockpot and stir until combined. 6. Add frozen broccoli to the crockpot and stir to combine. 7. Cover and heat 30 minutes more to cook broccoli and thicken sauce. 8. Serve over rice and enjoy! Happy Friday! Our favorite day of the week seems to have gotten here rather quickly, but you won't hear any complaining from us! To round out another week of blogging, let's get to some confessions. I confess... I don't understand why Girl Scout cookies are called different things in different regions. A caramel delite is a samoa, a shortbread is a trefoil, and a peanut butter patty is a tagalong. Let's get back to the basics and stop overcomplicating things, shall we? I confess... Facebook decided to up its game last week with options to not only like photos and statuses, but to love, laugh, be surprised, be sad, or be angry at them as well. Oh the possibilities. The jury's still out on how I feel about this. I confess... I love the idea of donating my hair and have always wanted to do so, but cutting off 8 inches will leave it pretty darn short. I am due for a good trim anyway and can't decide if I want to bite the bullet for a good cause or play it safe. Such first world problems, I realize. I confess... Parker and I had to board Jenny when we went skiing and missed that brown dog something fierce! Walking into your house without a waggy tail to greet you is just not right. I confess... Our neck of the woods is forecasted for snow and rain this weekend, and all this little family wants to do is be outside in the sun! A family fun run sounds so nice right about now! Since we are all wimps and won't run in the cold, that dream will have to wait. While we wait, here's a throwback... three happy (and tired) souls after a long summer run! It's the first weekend in March! Yall make it a good one! And please, if you live somewhere warm, go outside and enjoy the sunshine for us. 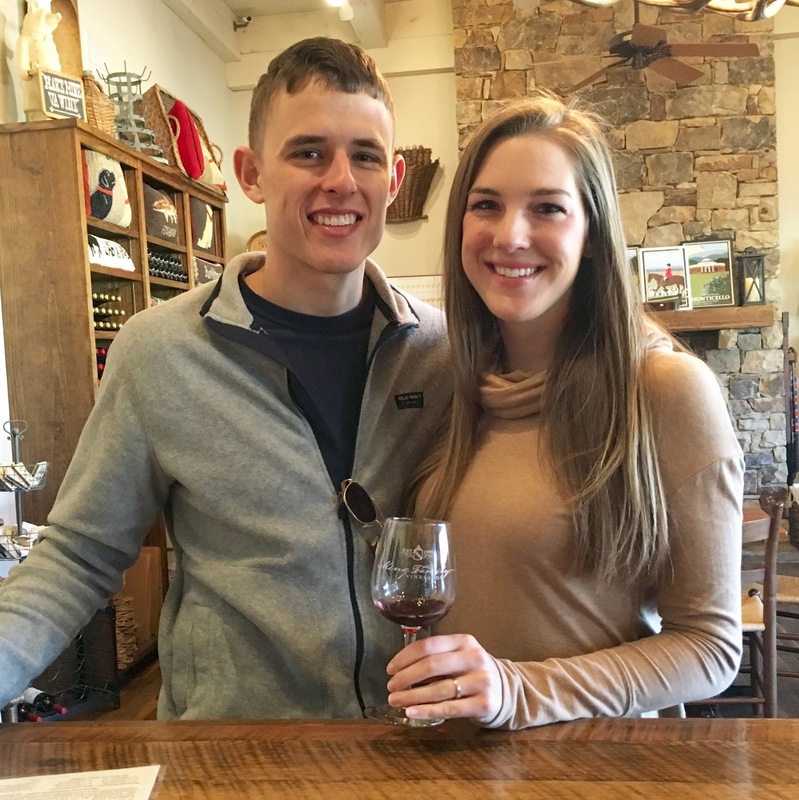 When we planned our ski trip to Wintergreen, a friend told us we really needed to check out the wineries while we were there. We are by no means winos but have recently started to quite like the grapey concoction, so we were game! We spent all of Friday and Saturday skiing and decided to hit up a winery on our way home Sunday morning. We arrived at King Family Vineyards at 10:30 AM and wondered why we seemed to be the only ones there. Then we realized we were at a vineyard at 10:30 AM on a Sunday morning. Probably not the most popular time for a wine tasting, but oh well! The views were beautiful, and we basically wanted to move in with a brown dog and never leave. There were horses running freely and cows happily grazing. It was very picturesque and felt like another world! The wine tasting was really fun. Neither Parker nor I know squat about wine, but we enjoy it nonetheless. We split a tasting since we still had to drive home, so we each got just a taste of the six wines in the tasting. I'd love to spout off the wines we sampled, but let's venture back to the whole we-don't-know-squat-about-wine part. We liked all but one that apparently had bourbon in it. Not our cup of tea... or wine. Our favorite was a Petit Verdot (no idea what those words mean, but it tasted good! ), so we bought a bottle to bring home as a souvenir. The girl who poured the wines was very knowledgeable and patient with our ignorance. Somehow, unbeknownst to me, she and Parker got on the subject of Game of Thrones and started theorizing about the characters and story line. I was quite thankful for the glass of wine in my hand at that point. Parker was obviously on cloud nine. Someone as into Game of Thrones as he is? Sign him up! All good things had to come to an end, but it sure was fun while it lasted! If you go to Wintergreen for a little ski action, stop by some of the wineries at the bottom of the mountain. King Family Vineyards was absolutely gorgeous and provided such a fun day date! What's you favorite kind of wine? When Parker asked me what I wanted for my birthday this year, I told him I wanted an experience. Presents are great, but I really wanted a fun memory! 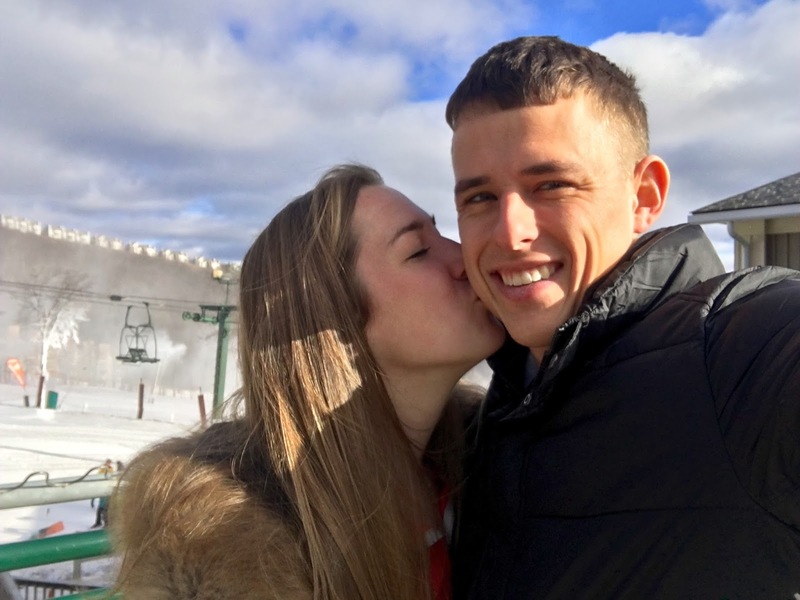 He truly outdid himself this year and planned the perfect ski trip for two! 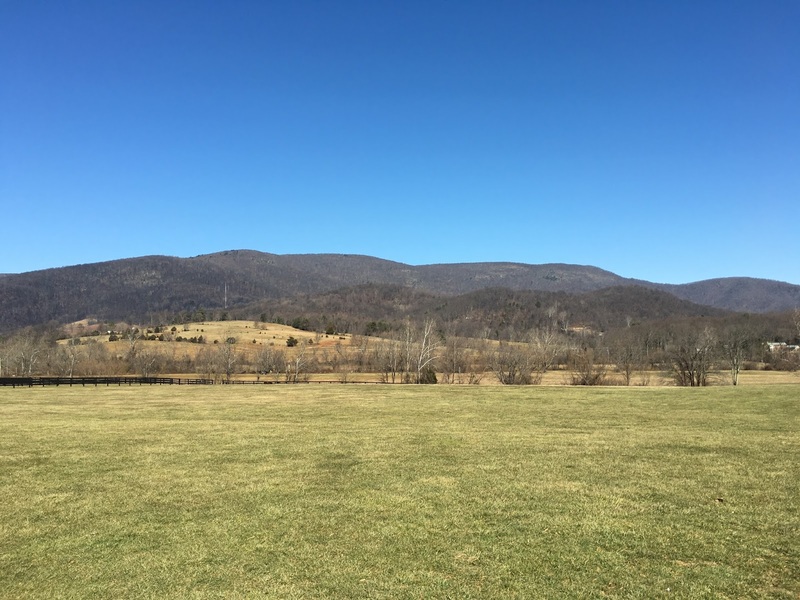 We chose Wintergreen, VA for its close proximity to home base (just a 3 hour drive and we were there!) and because many of our friends had been there and loved it. 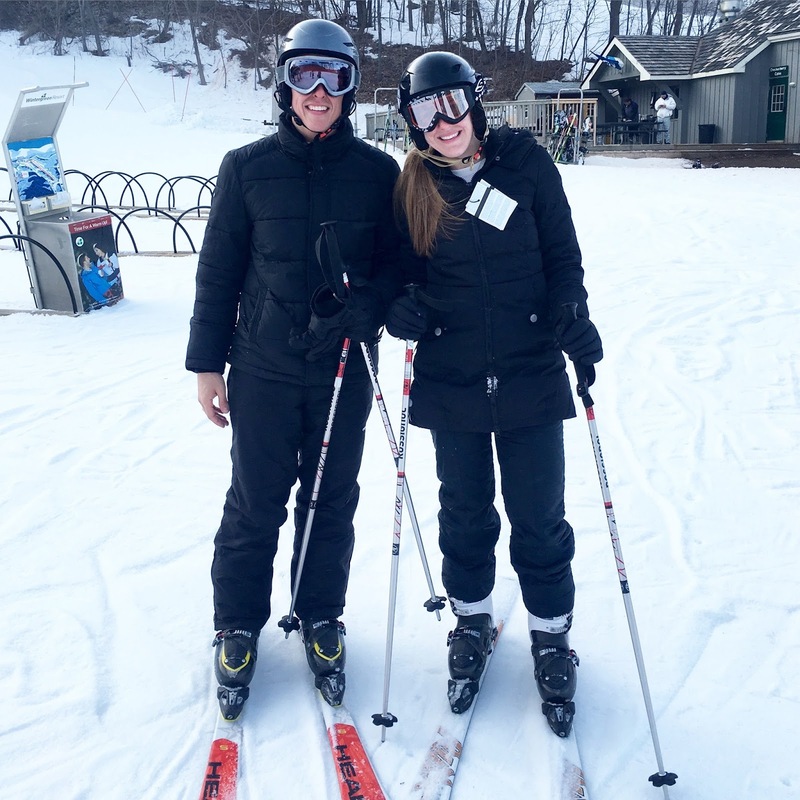 We had heard the slopes are a little shorter, which is true, but we are the beginners of beginners, so that was fine by us! 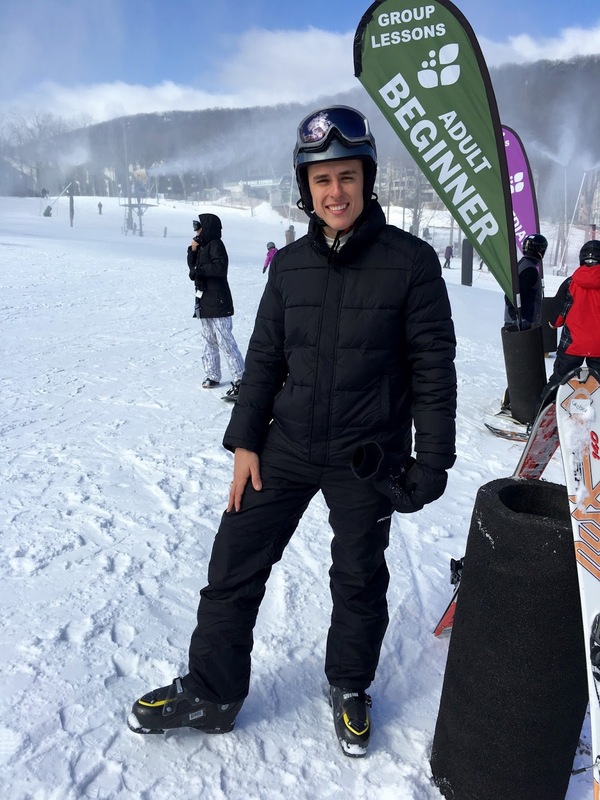 I went skiing with my family once in high school, but Parker had never been. He has been talking about wanting to go ever since we got married, so this trip has been a long time coming. 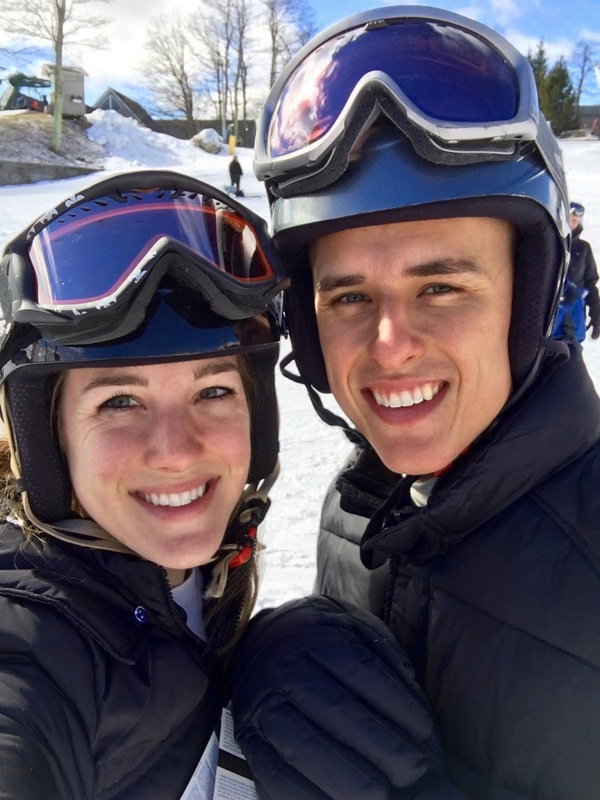 We were like little kids on Christmas the first day: all suited up in our warmest and ready to hit the slopes! We decided to take a lesson, which I highly recommend if you've never been or haven't been in a really long time. It was helpful just to get the basics down and probably prevented a few falls, although we still managed to fall a lot. More on that in a bit. We stayed on the green slopes the entire time. As excited as we were, our biggest fear was twisting a knee or an ankle, so we were Mr. and Mrs. Safety for the weekend. Slow skiing for the win! By the end of the trip, we felt like we could have graduated to the blue slopes but ultimately decided not to push our luck. When we come back next year, we will definitely (and carefully) try out the blue! 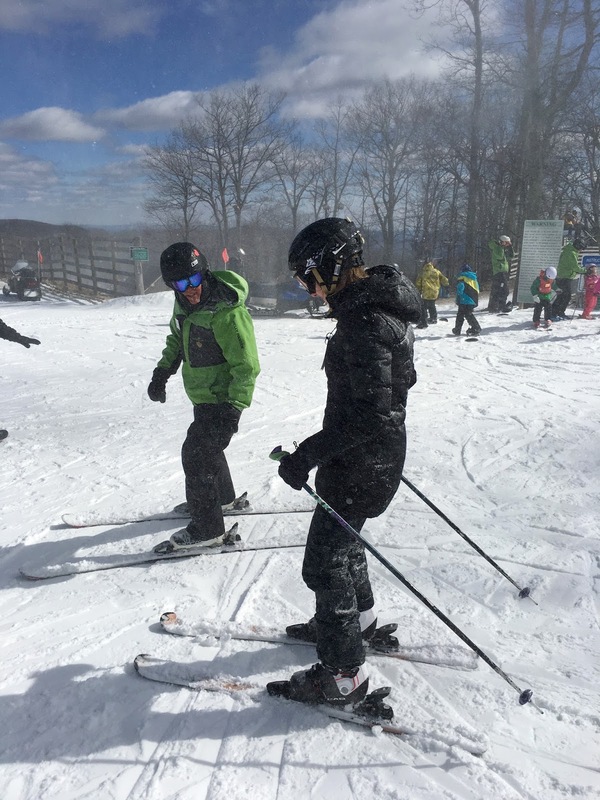 We skied about 7 hours both Friday and Saturday. Friday definitely had the perfect conditions. There were minimal lines for the ski lifts, and they were making snow all day, so the slopes were nice and powdery! Saturday, it was very crowded and a little icy compared to the previous day. 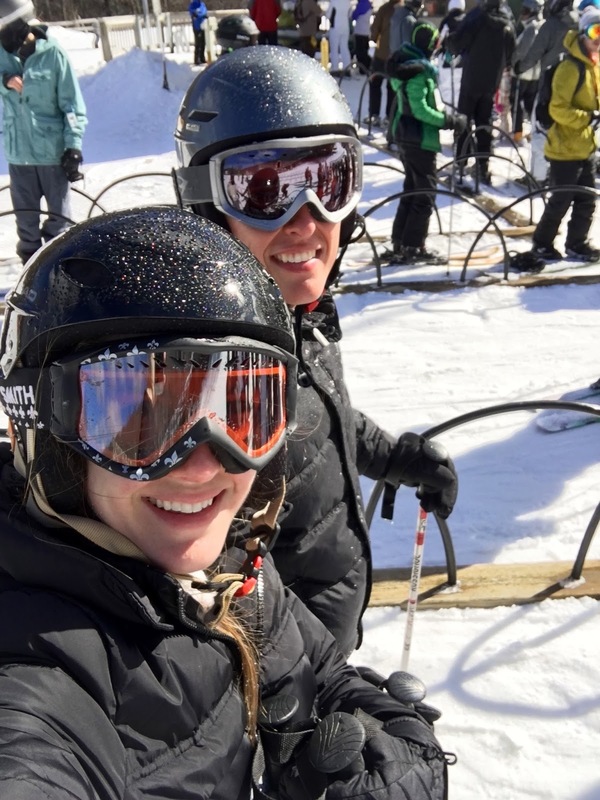 We spent a lot of time hanging out in line for the ski lifts, so we tried to make skiing down the mountain take as long as possible to make each run worth it! I'd love to say that we never fell, but that would be a lie. 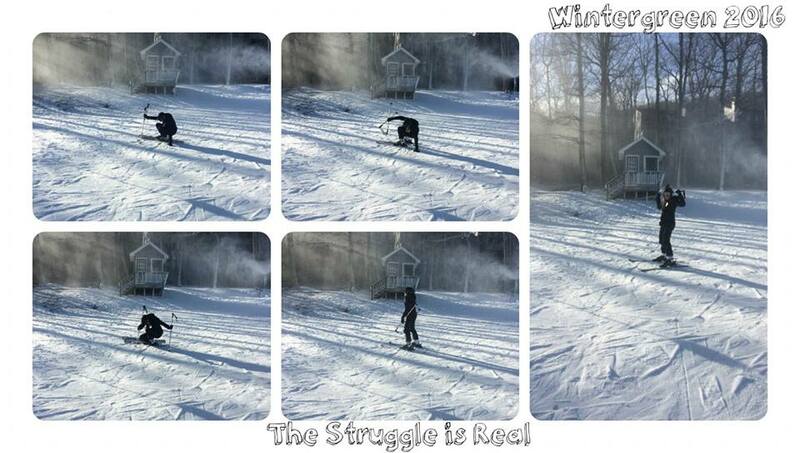 Despite our cautious decision to stay on the bunny slopes, we still faceplanted quite a bit! One of us fell a lot more than the other, but we won't say which one. ;) Funny enough, when we realized the other had fallen, each of our first inclinations was to pull out the phone to take a picture. A good fall needs to be documented! Parker decided to take it one step further and create this collage of pictures he took when I just couldn't seem to get up after a fall. Seriously, it's harder than it looks! He said it best... the struggle is real. It's funny, because the weekend was simultaneously relaxing yet exhausting. It was the perfect getaway, but we were both so tired by the end of each day. We were asleep by 9 PM the first night and 10 PM the second night, which is pretty early for us on a weekend. 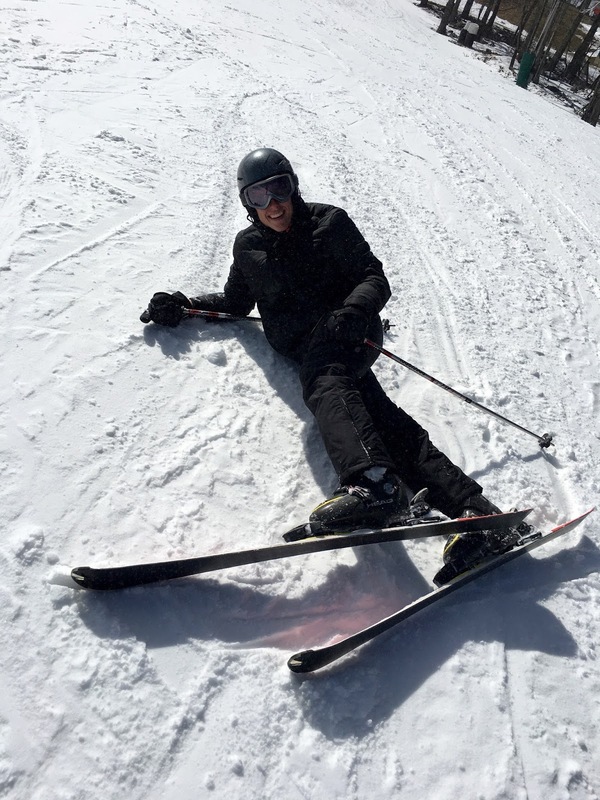 Skiing is no joke! 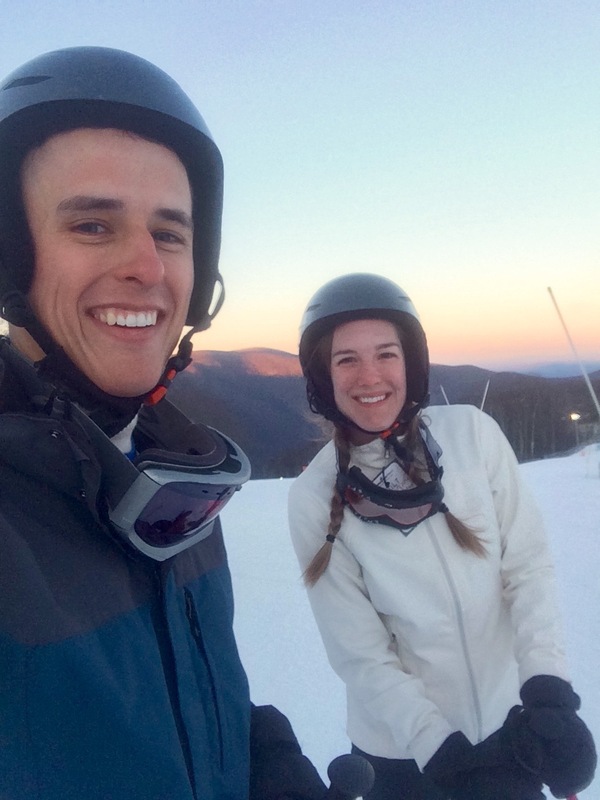 Skiing in Wintergreen has definitely been our favorite experience of the year so far, and I am so grateful to my husband for making such a perfect adventure buddy and best friend. We are counting down the weeks until we can go again next year!